Journey To Crochet | Enjoy the process of reaching your goals. When you see results, discipline comes easy. Its been a while.. I will always be in and out this blog post all the time. To stay constantly blogging has been all the time my wishes. Yes wishes but not hope. Wishes may not come true, whereas hope has a higher chance to be true. Whether blogging or not, my passion on crocheting has never stop. I have been continuously working on crochet products concurrently with my busy work life. I have been living my life fullest: eating healthily (cook myself most of the weekends), cycling to keep healthy life style, building my relationship with people, working hard to prepare for my retirement, feeling lucky all the time and keeping my stress level low (at least I tried!). Every week I work 5 days to earn for my two days of pleasure over the weekends, doing all the things I like to do. Crocheting is one of my best hobbies. It helps to reduce my stress from everyday life. As you keep repeating the same thing week after week till you get pretty bored, there comes the hiccup that tries to kick you out of the habit. You retarded and stop following your good habits and you may even went astray and pickup some bad habits like eat unhealthily, lazy on workout, spending time playing mobile hp games… etc. Then it comes to a point that you awake suddenly and want to go back to your good habit again. But the restart button usually takes some time to trigger. There I am now trying to go back to my old time good habit to constantly writing blog to update my crochet journey. 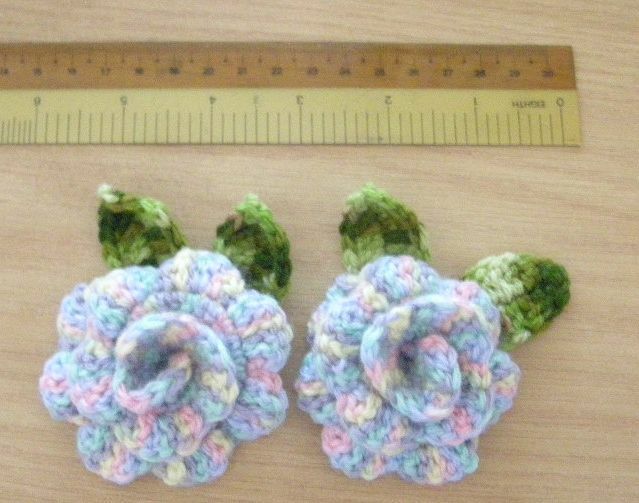 I am trying to concentrating on working on niche of my crochet product. Some unique features that I can find out from my products to discover a new product line. 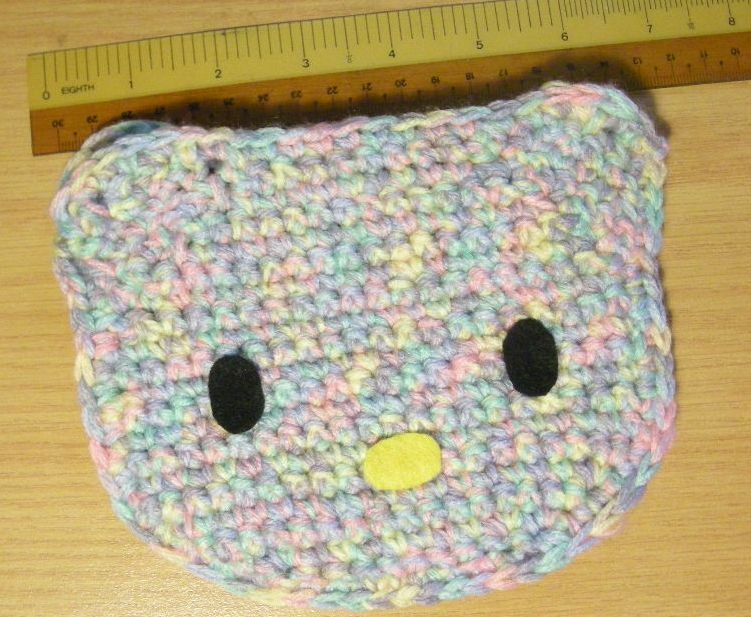 I hope to create my own crochet products and live my life working on them! Wish me good luck! Below is a crocheted handbag newly completed over the week end. Only collected yarn from SGshop on Saturday and finishing less than a day! I hardly recalled what I did on the January 2010. 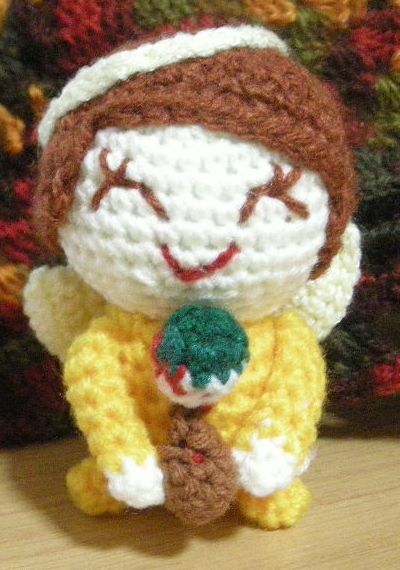 That was the time that I just started the etsy site selling my crochet doll. 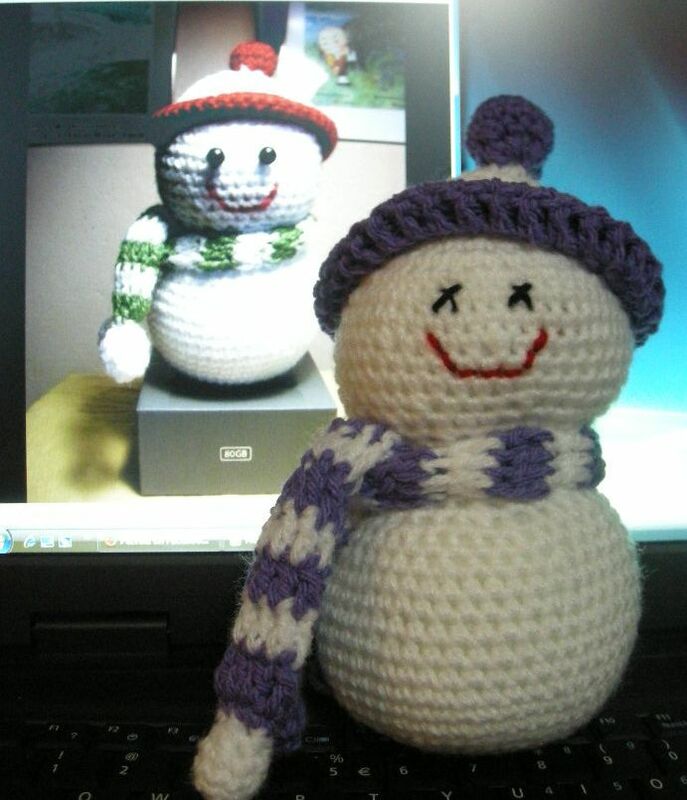 I was amazed that I sold my snowman two days after I setup the site. I decided a lot on what to do with my ‘business’. 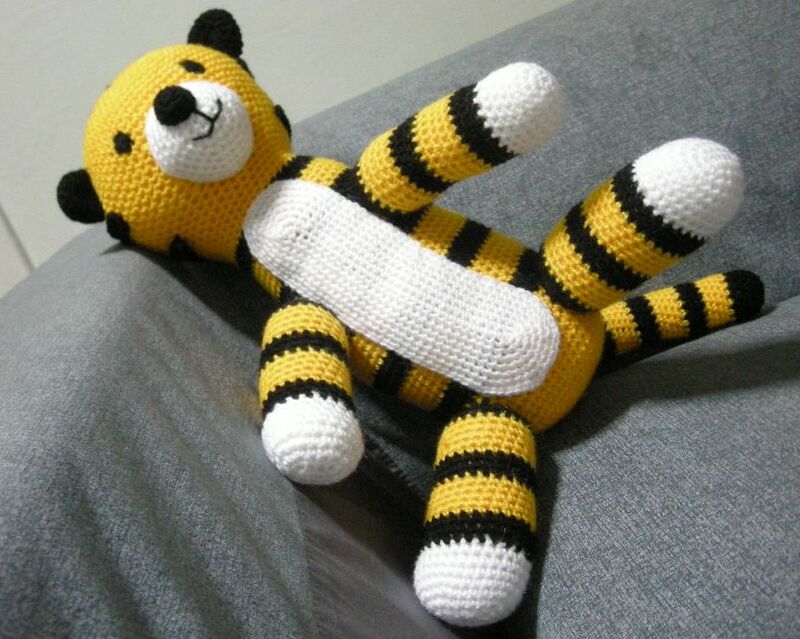 Since it is a tiger year for 2010, I decided to make a tiger doll. 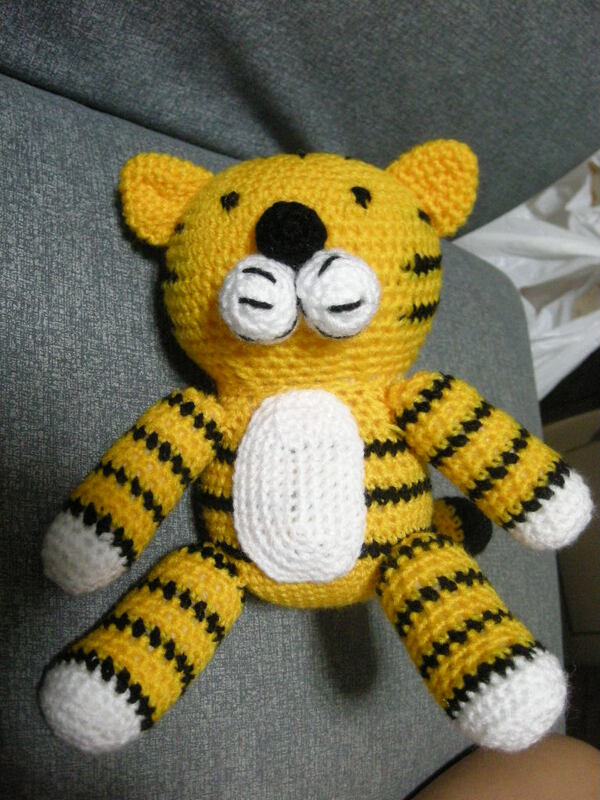 I searched the webstite to look for a tiger doll that resemble something I wanted to make and got myself creating one by looking at some other crochet dolls picture. I finally I made one and my friends and family loved it so much. 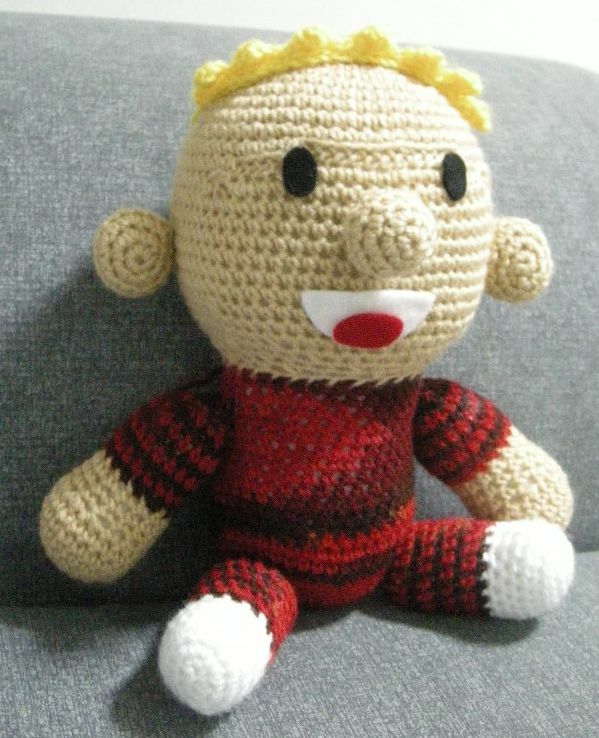 Though I may not sell any online (except the pattern) I managed to sold three of them to my friends a few months later. 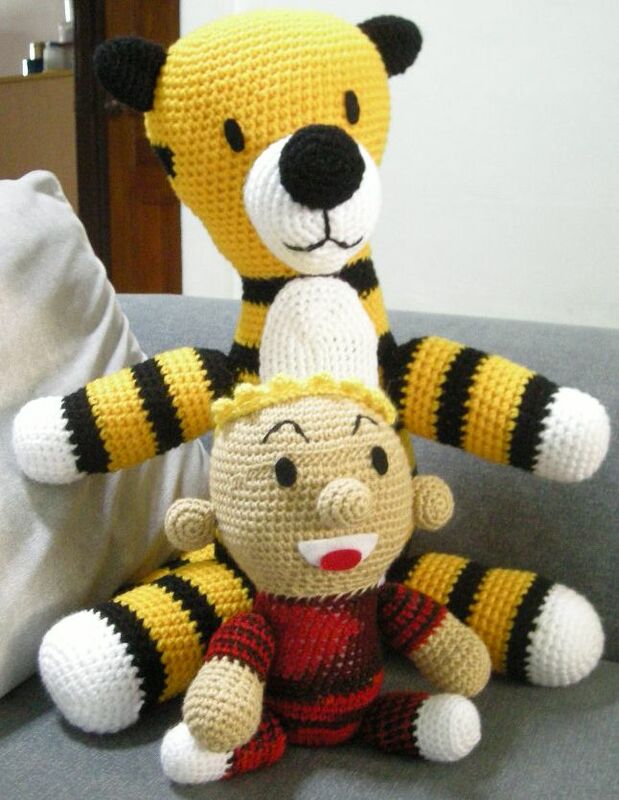 Due to popular demand, I decided to modify my tiger doll to the more popular hobbes (Calvin and Hobbes) in US. 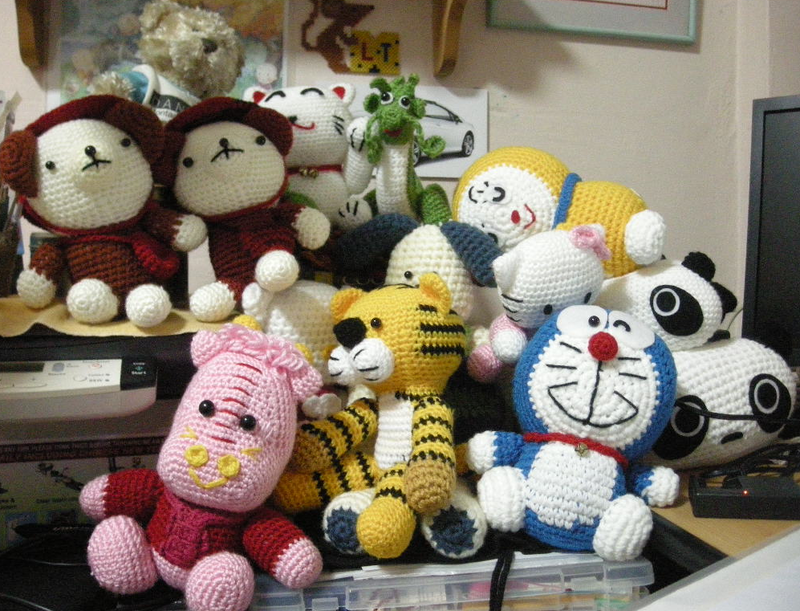 Since I am selling over at US site, I should not be making dolls that are popular over at Asia like Doraemon, Hello Kitty, amigurami Cats, etc. That was the time that I figured that I should focus more on market demand than what I think I like. I was also thinking of the Valentine’s season and trying out making a Heart angel Hello Kitty. Too bad it did not catch any buyer. Stay tune for my next blog on how well was my ‘business’. See you! It’s the last week of the year and I’m back to the setting new year resolution mode again. Looking back I have not fulfilled my year resolution that I set last year end, that is, to constantly update this blog. Well, this only proved that human is destined to be lazy and procrastinate with things that they dislike to work on. Funny I can constantly doing my crochet work and play with my facebook game everyday but not updating the blog. Ha! Ha! So get started now. Today is the 3rd day and I have three more blogs to write. Oh, almost forgot. Merry Christmas 2010! For a novice, you may not know the difference between the two and wonder which one is good to start with. 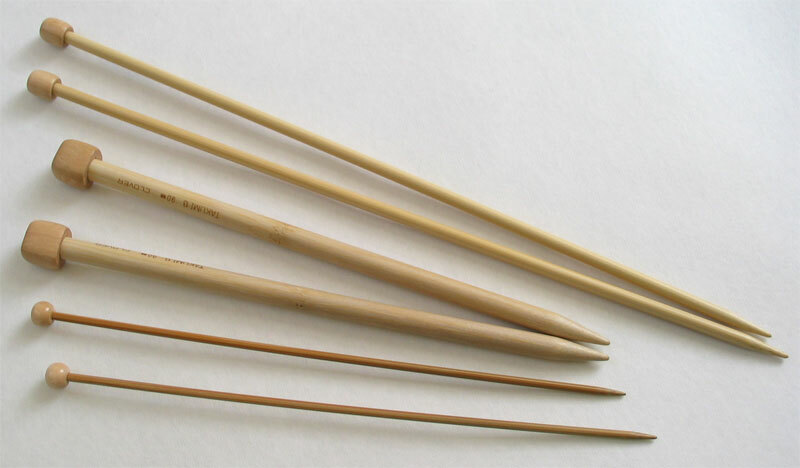 The simplest answer to this would be: one using a hooked needle and the other uses two needles without hook. That is as far as from the appearance point of view. In terms of product, you could see the difference between the two if you have worked on any of them before. 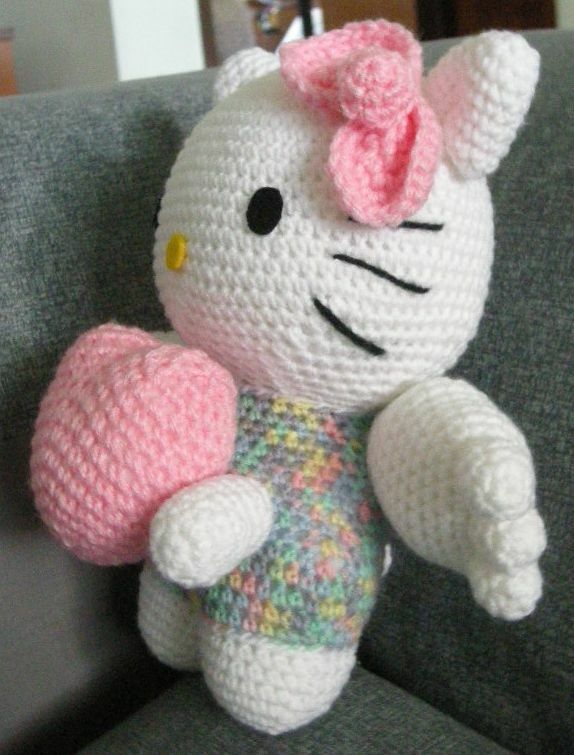 I started learning crochet since I was very young, at the age of around 10. I vaguely recalled learning the basic crochet technique from aunt: the simple chain, single crochet and double crochet, fan shape, etc. And thereafter, improvise my own design by combining the different techniques to make various products like: my own scarf, water bottle cover, motif, cushion cover, scarf and many other products. I cannot remember why I like this skill so much. When I first started work, I learn knitting from a yarn shop owner. I was amazed by the sweater produced by knitting and got myself hooked onto it. At that time, I thought knitting was for sweater and crocheting was for motifs. If you want products that comes with flowery ’ holes’, lots of see through in between yarns, you would rather choose crocheting than knitting. If you want tighter texture with little see through, you rather choose knitting than crocheting. This only falls true if you are limited to only knowing a few patterns for knitting and crochet. Throughout the years, I have dropped off the passion of knitting and crocheting on and off. I have picked up other interest like cross stitching, hardanger and paper clay making, etc. For the past few years, I restarted aggressively back to crocheting. I did lots of products: from motifs, scarves, dolls, cushion covers, handbags to big project s like blouses, shrug, sweaters, skirts, afghan, curtain etc. It was during this period I realized that crochet could really do all kinds of wonders. Most of the thing that knitting could do crocheting could follow too. I’ve discovered lots of crochet pattern made for sweater, scarf, socks etc that looks very much like knitting. I always find that using one hooked needle is much easier to handle than working with two unhooked needles. This is because at any one time I only need to care about one open loop rather than a row of open loops. I’m sure most of the knitters experienced the occasion of dropping one of the stitches in a row. Re-hook back the dropped stitch to me is a terrible nightmare, especially if you are dealing with yarn that has difficulty showing a clear pattern. Although they said knitting would be much faster than crocheting, especially come to make large projects like a sweater, I rather stick to crocheting. I could concentrate on one open stitch at a time. Throughout the years, I have sourced many books on crochet patterns. Found that the fundamental patterns have been around for many years and crochet designers keep revamping new design out of old patterns. However, crochet has been recently put on runway and became part of fashion icons these days. You could see different kinds of fashionable wears that ladies love to wear. 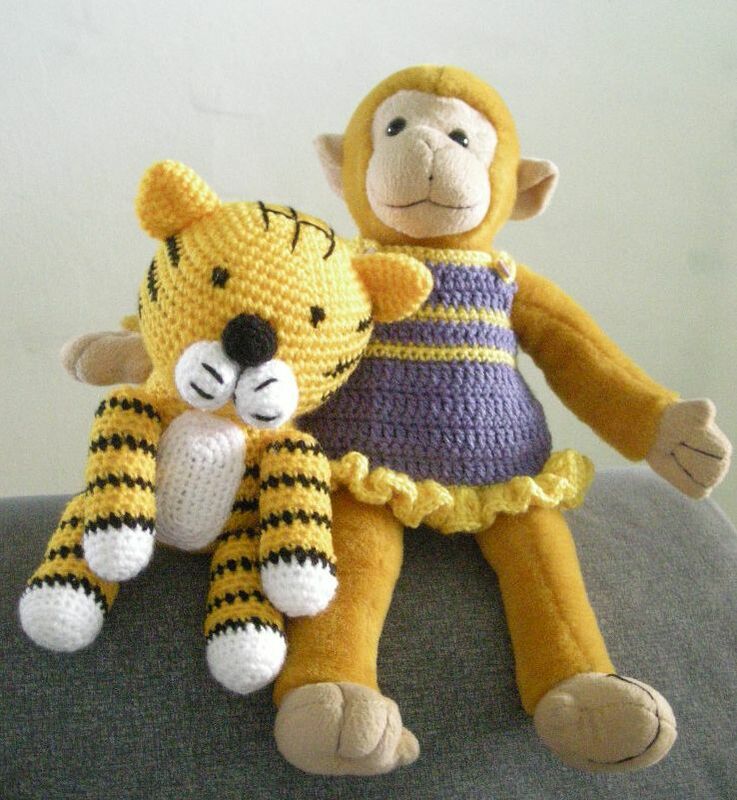 Hand knitted products no longer only belongs to old folks sitting on armchairs making for their grandchildren, children, friends and relatives. It became more commercialize and you could see more people willing to buy handmade products online. I hope these hobbies could be more appreciated in future. Long live crochet and knit! I came across a few people asking what kind of yarn to use for my crochet doll and decided to write down my point of view on yarn selection. In the tropical country that I stayed, we seldom has the need to wear thick clothing that made from pure wool or fur. So when I select yarn for wearing purposes, I will try to avoid such thick yarn and choose more cooling yarn that made from cotton or bamboo material. 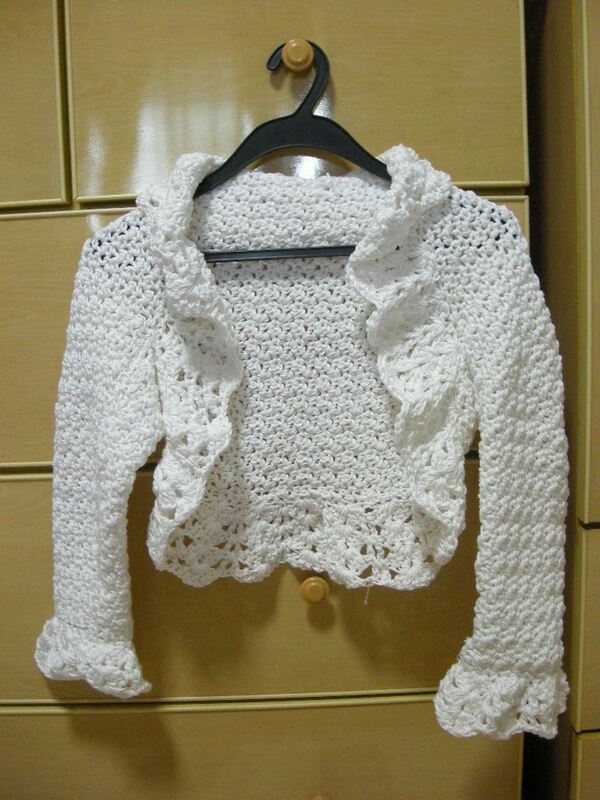 This types of yarns are quite hard to come by in the context of my small country, Singapore, whereby it is hard to find the group of knitters and crocheters who are willing to spend time to knit a cotton made blouse or skirt to be wear under the bright Sun. However, there are still people willing to make a pure wool scarf, pullover or sweater only to be used in an air-conditioned room, when travel overseas or send it overseas as presents. As for me to find a better source to find cooling yarn for me will be via internet. Usually yarns sold on internet could be in quite a reasonable price, provided the currency conversion is acceptable and the shipment cost is low. However, to ship yarn that sold in US or Canada to Asia is still pretty expensive and may easily cost double or triple its original price. I have also tried to buy yarn from countries that were closer to me like China, Japan or Australia. 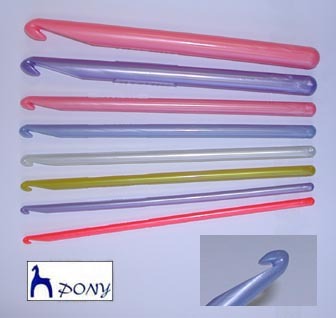 For Australia, we have a great store here, Spotlight, which provides the supplies. I hope we have more locals here who love this hobby and so increase the yarn sale which in turns trigger Spotlight to ship more varieties of yarn here. As for China I may not want to venture into it due to its quality. I heard some purchase cases that state what you see on internet may not be what you get at times. Good yarn from Japan is pretty expensive. 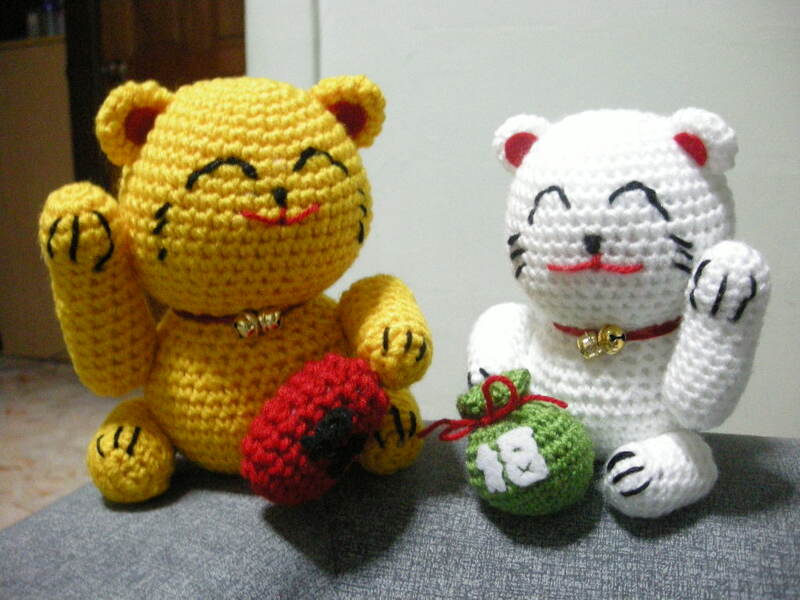 We do have a crafty shop over in Singapore that sell Japanese yarn, called Golden Dragon. Some of the yarn price as compare to overseas is better and some could be pretty expensive. Once a while I would pamper myself to buy some ‘expensive’ yarn over the internet. The price stated on internet is not that expensive. However after taking into account of the shipment cost, it becomes. But still I prefer to get some yarn over the internet to explore other types of yarn. Sometimes I really envy people who stay in seasoned countries who could make all kinds of products from different types of yarn. You won’t have the problem of not finding any occasion to wear them. Back to choosing yarn material for making amigurumi dolls. Usually you don’t want to spend too much on doll materials unless you are make a doll for a person with sensitive condition like asthma or similar. So I choose 100% acrylic yarn. As for size of the yarn, I usually choose 8 ply yarn that uses 4 to 4.5mm crochet hook sizes to make dolls that are taller than 10cm. At times I would need to double up the yarn to make something bigger. 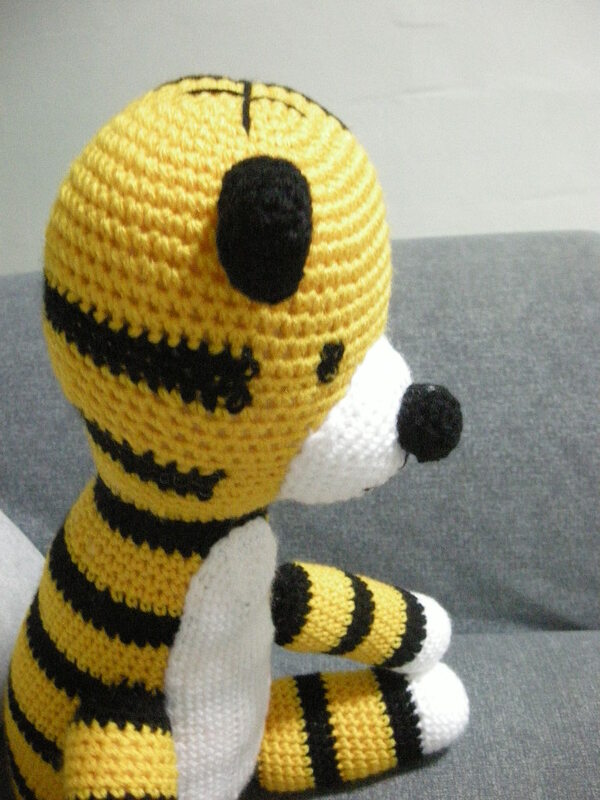 My 16 inches tall hobbes are made from two strand of 8 ply yarn. So no matter what type of yarns you used, it is worth to take the risk to try it out. It may not be suitable to a project you choose in the first place. Then try it on other projects. The more you try out the more experience you will get and who knows the outcome may be something out of a surprise and a fulfilling one.